1. Sprinkle the fish with the turmeric and set aside. 2. Spray a large pan with oil and cook the onions with the seeds for 5–10 minutes until golden. Add the coconut milk, tamarind paste and shredded ginger and bring to a simmer. 3. Add the fish and mangetout to the pan, cover and simmer gently for 3–4 minutes until the fish is cooked. Scatter with sliced salad onions and chillies and serve with brown basmati rice. 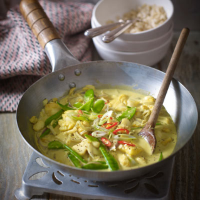 This is a delicate, sweet curry but you can add heat by mixing a little chilli powder with the ground turmeric. Our new Spanish Light Grenache Rosé, La Mancha would be perfect here, and with only 5.5% alcohol, it’s a relatively healthy option too.